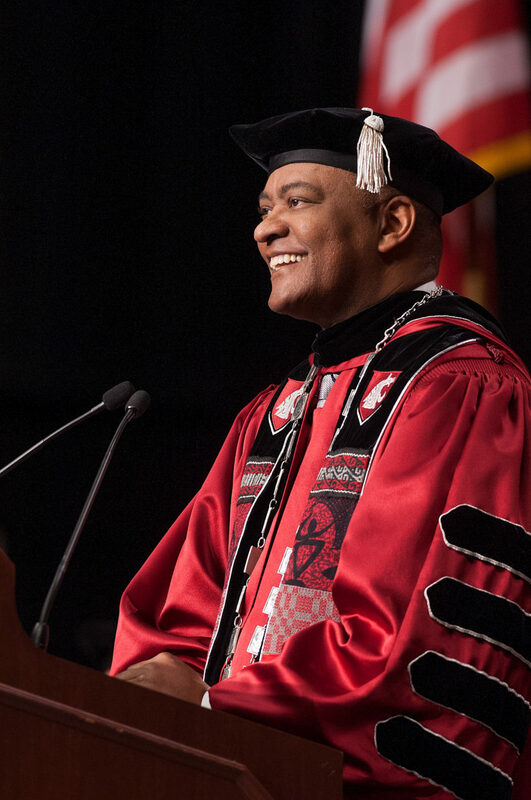 Elson S. Floyd was the 10th president of Washington State University, serving from May 21, 2007, until his passing on June 20, 2015. During his tenure, Floyd consolidated all of WSU’s health sciences programs at the WSU Spokane campus, garnered bipartisan support for WSU’s medical school, ushered in a new era of WSU through investments in facilities, and led the university’s $1 billion advancement campaign. “E Flo,” as he was known among WSU students due to his approachability, regularly attended and sat in the student section at sporting events, knew many students by name, and often gave students his personal cell phone number. Recognized for his transformative and visionary leadership, Floyd’s pursuit to create WSU’s own separately accredited, four-year medical school at WSU Health Sciences Spokane led to the university naming the medical school the Elson S. Floyd College of Medicine.